Started your Tarot journal yet? If not, please consider doing so as it is the most effective way to learn Tarot for yourself, internalize it and make it an authentic way to tap into your own intuition. The fool in the Tarot is represented as the number 0 or 22 depending on what deck you use. The Major Arcana is considered the “Fool’s Journey” and he represents the individual on his/her life path. When the fool comes up in Tarot it asks us to reflect on our journey. We can see in this card that the young man is open to the journey itself. He is dancing along on his path with his little dog and is very “in the moment”. He’s not looking back and he’s not too focused on the distant future and as a result, he is able to enjoy the present moment more. This card focuses on learning to be present and aware. Be mindful of where you are heading (so as not to dance over the edge of the cliff) but also embrace current opportunities with an open mind and heart. Take time to celebrate possibilities and to enjoy what is since time is fleeting. 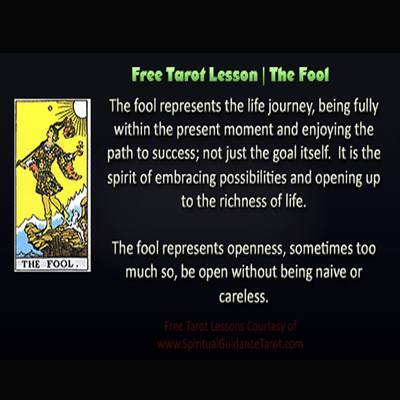 Fool represents newness, opportunities, being absorbed in the present. It also warns not to be oblivious however or to be so stuck into temporary satisfaction that you lose sight of long-term goals altogether. Be sure to subscribe to my blog for additional Tarot inspirations and other resources only available to subscribers!